Pokot history is a complex one which is difficult to outline. The Kenyan census places them in the Kalenjin group, diverse groups of people who share Nilo-Hamitic ancestry. Throughout their history their nomadic lifestyle has resulted in contact with other peoples from the region. Intermarriage has brought about an intermingling of social customs; many Pokot customs have been borrowed from their neighbouring Turkana and Karamojong peoples. At the centre of Pokot subsistence and commercial activities are cattle keeping and grain growing (traditionally sorghum and finger millet; more recently maize). Approximately one quarter of Pokot peoples are cultivators or corn people, while the remaining are pastoralists (formerly cow people, more often now goat people.) The Pokot in the area around Marich and Tikeet tend to be goat people though some also cultivate maize and other crops. Among both groups, however, wealth is measured by the number of animals one possesses. Cows and goats are used for barter, exchange and as a form of bride wealth. A man is allowed to have more than one wife providing he has sufficient number of cows to offer her family in exchange. Cows are rarely slaughtered for meat being a more valuable asset alive. This is the same for goats and to a lesser extent sheep. The milk, butter and cheese they provide are integral components of Pokot dietary needs. Pokot society is governed through a series of age grades. Membership to a particular group depends on the age at which one undergoes initiation. For men initiation is usually between the ages of fifteen and twenty, whereas for young women it happens around the age of twelve. Following initiation, young people are allowed to marry and to participate in local economic activities. Close bonds are formed within initiation groups which serve as future political ties. Old age commands a degree of status and respect among the Pokot; elders preside over essential community decisions, religious ceremonies and festivals. The Yellowmen are a group of Sussex Rotarians and friends led by Eddie McCall who have been working in Central Pokot, North West Kenya for the past twelve years, helping the local tribespeople. Next scheduled visit to West Pokot with a team of 14 Yellowmen. Click the image to view a more detailed map. 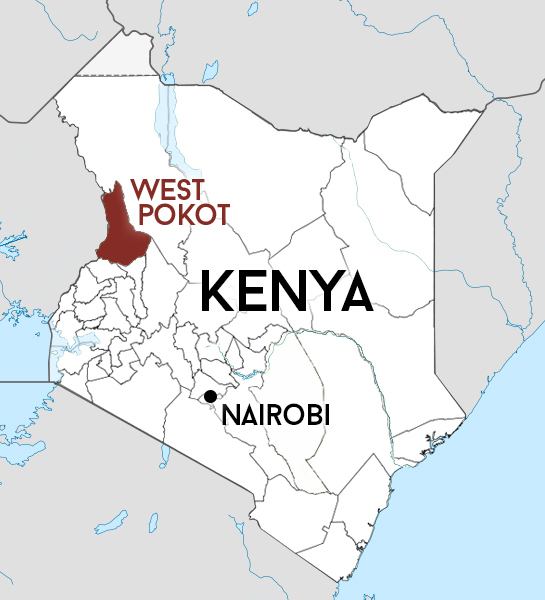 West Pokot County is a county of Kenya with a population of 512,690 and an area of 8,418.2 km². There are two main subgroups among Pokot: Cultivators (‘corn people’) and pastoralists (‘goat people’). Wealth is measured by the number of animals one owns. Cows and goats are used for barter, exchange and as a form of bride wealth. Copyright © The Yellowmen of Kadongdong (2014). All rights reserved. Registered charity number 1038586.